Spending his entire 23-year career with the Red Sox, Carl Yastrzemski is the only AL player to collect over 3,000 hits and 400 home runs. 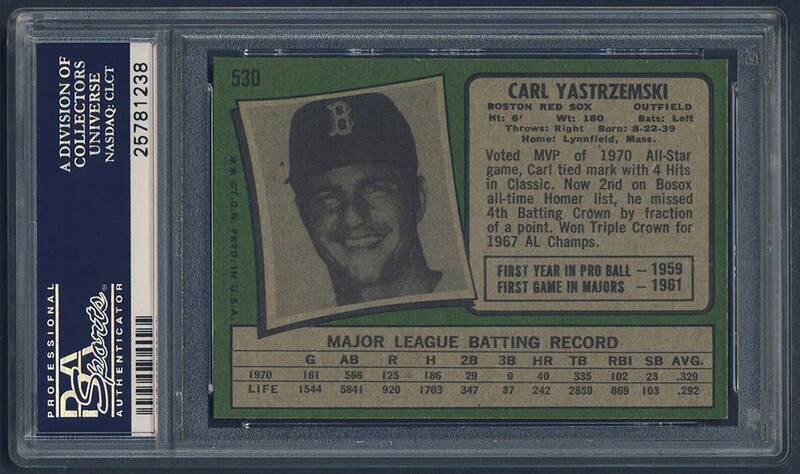 "Yaz" will always be remembered for one remarkable season - 1967, the year of The Impossible Dream. As a testament to his outstanding performance that year, he won the Triple Crown. During a remarkable September that season, he single-handedly won the pennant for Boston. Taking over left field for Ted Williams, " Captain Carl" soon proved that he belonged in the same category, winning batting titles in 1963, '67, and '68. He had 3,419 career hits, a .285 average, 646 doubles, 452 home runs, 1,844 RBI, 1,816 runs scored, and 1,845 bases on balls. Comments: I don't have record of the purchase but acquired a 1971 Topps PSA 8 sometime between 2000 and 2005. I upgraded to this SGC 92 example when I spotted the card at a dealer's table (Marshall Brockman) in 2009 at The National. I went back a couple times, haggled on the price and decided to pick it up. The card features a near flawless black border all around. 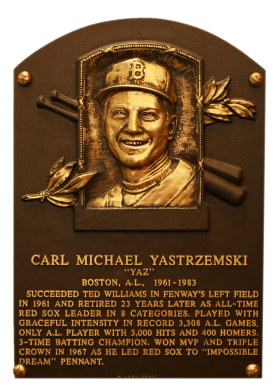 "Yaz" will always be remembered for one remarkable season - 1967, the year of the Impossible Dream. This one is oh-so-close to MINT! I'd like to purchase a certified mint example at some point but really want to see the card in person to ensure the card is high-end. UPDATE: The first week of Sept, 2015 a PSA 9 1971 Topps Yaz showed up on eBay...going for it! No luck - auction ends at $655.99 on 09/14/2015, too much for my pocketbook. UPDATE: In June, 2016 I decided to purchase a PSA 9 Yaz as an upgrade to the SGC 92 example I owned. PWCC was offering a centered example with what appeared to be perfectly sharp corners and no black border chips. Under zoom the card looked fabulous. I entered a snipe based on recent sale prices and won the card late that evening. I promptly entered the card into the PSA registry. 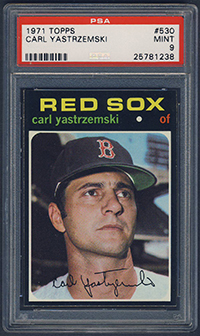 Description: In 1971, Topps again increased the size of its set to 752 cards. These 2-1/2" X 3-1/2" cards feature a large color photo with a thin white frame. Above the picture, in the card's overall black border, is the player's name, team and position. A facsimile autograph completes the front. Backs feature a major change as a black-and-white "snapshot" of the player appears. Abbreviated statistics, a line giving the player's first pro and major league games and a short biography completes the back. Specialty cards in this issue are limited. There are statistical leaders as well as World Series and playoff highlights. 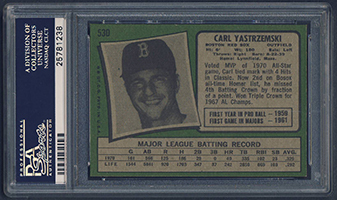 High-number cards #644-752 are scarce, with about half of the cards being short-printed.